Vultures don't appear on most people's safari checklist. These beady eyed, bald headed creatures are viewed as ugly and sneaky. Vultures have even managed to earn a “bad” reputation which is clearly evident from the roles they portray in animated movies, where they often appear as the “baddies”, a clear indication of trouble or the bearers of bad news. However, vultures are quite misunderstood and if you are able to put aside your vulture prejudice, you might realise just in how much trouble they are and how their decline affects all of us. The IUCN Red List of Threatened Species is the world’s most comprehensive information source of the conservation status of plant and animal species. According to the latest assessment, six out of the 11 vulture species found in Africa have declined in number by an average of 62% over the past 30 years. The status of White-backed-, White-headed-, Rüppell’s- and Hooded vultures worsened from Endangered to Critically Endangered, whereas the Cape- and Lappet-faced vultures tumbled from Vulnerable to Endangered. Why are vultures so important? As scavengers and carrion eaters, vultures play an important role in the ecosystem. Vultures are mother nature’s number one clean-up crew - the brooms of the animal society. Vultures are equipped with a digestive system that contains special acids that will dissolve anthrax, botulism and cholera bacteria. The bald or lightly-feathered head is specially designed to stay clean when confronted with blood and bodily fluids present in carcasses and any remaining germs are baked off by the sun. By consuming animal carcasses that would otherwise be left to rot and spread disease vultures keep the number of mammal scavengers down and in turn prevent the spread of life-threatening diseases such as rabies and anthrax among animals and humans. The crash of India’s vulture population during the 1990s gives modern day society a clear indication of what could happen if vulture populations in Africa become extinct. 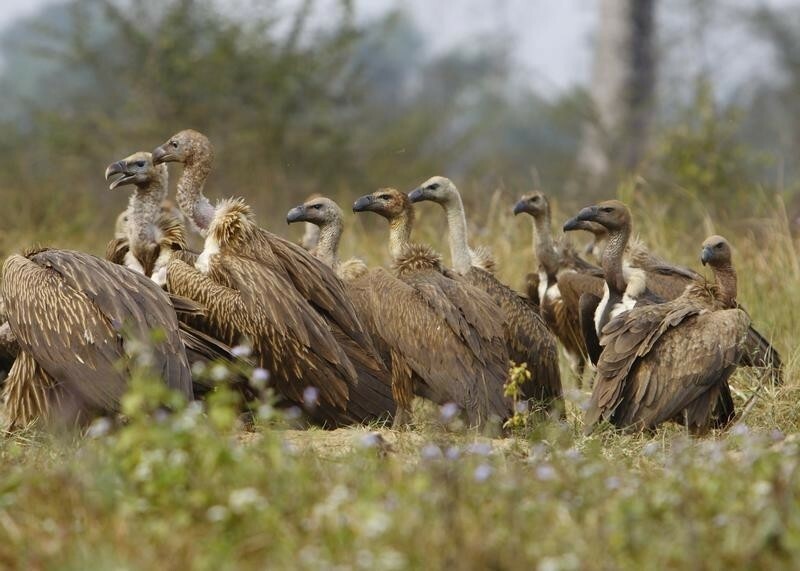 The rapid decline of approximately 98% of India’s vulture population was attributed to the popular veterinary drug Diclofenac. Diclofenac is a nonsteroidal anti-inflammatory drug used to reduce inflammation in cattle and other livestock to which vultures are highly allergic as it causes liver failure. As a result, feral dogs had a sudden abundant source of carcasses to feed on as they have replaced vultures as the main scavengers. Not only did feral dog population numbers explode as a result of the absence of vultures – rabies numbers shot through the roof as the dogs became the primary reservoirs for the virus. This “Asian vulture crisis” caused India to spend an additional $34 billion dollars on healthcare as they accounted for 20,000 out of the 55,000 annual global rabies deaths. Vultures wait to feed on a cow carcass at a vulture restaurant in Nawalparasi, southwest of Kathmandu February 2, 2012. Incidental poisoning of vultures occur when people attempt to deliberately eliminate large predators of livestock and small stock. For example, someone will deliberately contaminate a carcass with poison intended for a lion, feral dog or hyena – but in the process the carcass attracts vultures and other animals. Deliberate poisoning arises when poachers intentionally target vultures to avoid them giving away the location of their illegally killed big game carcasses such as rhinos or elephants. Between July 2011 and 2014, at least ten such poisoning incidents were discovered, which resulted in the deaths of at least 1,500 vultures across six southern African countries. The use of vultures is an important component of traditional medicine, particularly in southern Africa. Approximately 80% of the population in South Africa uses traditional medicine in one form or another because pharmaceutical drugs are too expensive or traditional methods are considered more appropriate. Vulture body parts are believed to be most effective for providing clairvoyant powers, foresight and increased intelligence. Wildlife researchers and conservationists have recently discovered that lead poisoning has had an influence on vulture numbers as vultures feed on carcasses next to highways and roads. The animals ingest high volumes of lead as they eat the vegetation next to the road that has been contaminated by emissions from vehicles, while some water sources are also high in lead content. Other factors that contribute to the decline in vulture numbers include habitat loss, collisions with wind turbines and electricity powerlines, human disturbance and drowning in sheer water reservoirs. Time is running out and therefore conservationists, wildlife researchers and NGOs need to work with law-makers, government agencies and the general public, to make sure there is a future for these magnificent creatures. Governments need to help regulate veterinary medicine and the pesticide industry. This will prevent medicine like Diclofenac from destroying entire populations and prevent incidental poisoning. An even bigger responsibility rests on the shoulders of conservationists and NGOs, who need to create awareness of vultures and their plight. One such example can be drawn from Botswana where Kanabo Conservation Link, Raptors Botswana and the Kalahari Research and Conservation Group started the first official vulture restaurant in Botswana. A vulture restaurant is a regulated, safe place for vultures to eat lead- and poison free carcasses. This restaurant forms part of their scientific research programme and serves as an educational basis for kids and adults from local communities. Over the past year this project was able to educate more than 1000 kids from all over Botswana.